From Washington comes the report that the new inkstand made by Tiffany & Co. for Vice-President Fairbanks has been delivered and is much admired. The price, it is said, was $250. The prize cup offered for the Briarcliff automobile race last week was made by Tiffany & Co. It was donated by Walter W. Law, Briarcliff Manor, Westchester County. A gem of a coach is on exhibition in Tiffany & Co.’s store, New York, an exact miniature copy of the original four-in-hand, that first ran between London and Brighton-England. The body of the model is of brass upon which the true colors of everything about the coach are reproduced. The handles and the trimmings are of solid silver. Back of the rear seat, the usual extra shiffletree is lashed and beneath it appears the name of the coach “Good Times.” Over the door window is the name James Selby, and on the panels of the door and coach are lettered. Horse Cellars, Piccadilly from which it started, and the names of several towns where stops were made. The ends of the bugle and parasols are seen protruding from the seats to which the blankets are strapped. The model is intended as an ornamental cigar-box ; two sections of the seats lift off for cigars and matches, and the lamp in front serves as a cigar-lighter. Tiffany & Co. are advertising rewards for the return of two pins lost by customers. One, for which $500 is offered, was lost in Newport, R. I., and is a diamond and sapphire bar pin, containing a blue sapphire, a yellow sapphire, a brown sapphire and diamonds. The other is an oval enameled pin, surrounded by diamonds, with diamond initials J. W. H. in center and pear shaped pearl pendant. This pin was lost Monday evening. Nov. 21. in the Garden Theater or in Madison Ave. In a letter to the Sun Thursday, H. H. Treadwell, of Tiffany & Co., corrected an erroneous general impression that the Dewey gold loving cup bears the names of the Mayor and members of the committee in its inscription. George F. Kuntz's European Trip.—George F. Kuntz, of Tiffany & Co., who has recently returned from an extended trip abroad, visited every country of Europe, including Russia and Spain. Mr. Kuntz attended the annual banquet of the Chambre Syndicate des Diamants et Pierres Precieuses au France, in Paris, of which he is the only foreign honorary member and correspondent, and was also entertained at dinner at Oxford by a local society. Mr. Kuntz's business matters led him to Madrid, Valencia and other Spanish cities, at all of which he was received most politely and kindly by the upper classes, and nowhere in Spain did he observe any outward manifestation of ill-feeling on the part of the Spanish people toward himself or other Americans. Mr. Kuntz was in Valencia about the first of May, and at that time there were but two other Americans in the town, although before the war, Valencia being the headquarters of an United States Consulate, quite a colony of Americans was in residence. Now that full diplomatic relations with Spain have been resumed, many members of the former American colony will return. The loss of her colonial possessions, Mr. Kuntz thinks, is a blessing in disguise for Spain, as the Motherland is wonderfully rich in natural resources, and if due attention is paid to their development, a much brighter future awaits our late antagonist. Mr. Kuntz sailed for home from Gibraltar, May 8, on the Aller, and reached New York on the 17th, after a three months' absence. Wm. Tiffany, son of Chas. L. Tiffany, is reported to have joined ex-Asst. Secretary Roosevelt’s regiment of Rough Riders. John B. Brosseau, for many years foreman of Tiffany & Co.’s workshop, Fifth Ave. and 37th St., New York, was arrested last Wednesday on the charge of larceny, committed by padding the pay rolls. Subsequently he confessed. According to the statements that have been made, about $5,000 was stolen each of the last two years. How much farther back the thefts have extended will not be known until an examination of his accounts is complete. Brosseau, who is 59 years old, had been with the company 35 years, working his way up during that time to a position of peculiar responsibility. His examination was postponed in the Tombs Police Court until to-day. Since the arrest the police have not hesitated to express their suspicion that he stole the three pear-shaped diamonds valued at $35,000, which mysteriously disappeared from the workshop about a year ago. It is now revealed that the police at the time of the robbery had a suspicion of Brosseau, but the members of the company were so firm in their confidence of his honesty that no espionage was placed on him, and his name was held from publicity. Brosseau denies that he took the pear-shaped diamonds, or that he stole in any other way except by padding the pay rolls. His counsel, B. Cunningham, last week, was quoted in the daily papers as saying that in case Brosseau was allowed to make restitution and go free, he would expose other leakages in the jewelry establishment. The members of the company say that such a proposition will not be entertained, and that there have been no robberies except those that have been published. The method by which Brosseau robbed the company was simple and was possible only because entire confidence was placed in him. He sent his requisitions to the cashier for the money with which to pay the money to the men. The amounts in his payroll were larger than what the men actually received. His books have not been examined for a number of years, and there was no comparison during this time of the amount turned over to him for salaries and wages and what he actually paid. For some time the officers of the company have been aware that they have been losing money, and detectives were employed to trace leakages. After some investigation the circumstances pointed to Brosseau, but even then the officers of the company were loath to think that their trusted employe was dishonest. When the case against Brosseau seemed complete the facts were made known to Ralph M. Hyde, the superintendent, and Col. H. H. Treadwell, a director. This was a couple of weeks before the arrest. Brosseau said that he was willing to turn over his equity in his home at 413 Lenox Ave. in order to make restitution. Charles Cook, the president of the company, who had been ill, learned about this time of what had happened, and he directed that the law should have its course. family caused unusual expenses in recent years. His son, Gerald, had a position as salesman for Tiffany & Co., beginning about two years ago, and resigned a month ago. The building formerly occupied by Tiffany & Co., at Union Sq. and 15th St., which is being remodeled for wholesale commercial purposes, was, last week, leased for 10 years, at an aggregate rental of $300,000. Janies W. Colburn died in Saratoga, N. Y,, July 4. He was one of the most familiar figures in Tiffany & Co.’s diamond department, where he had served the house for over a quarter of a century. His ancestors came from England in 1642 and settled in the vicinity of Dedham, Mass., near which place, in 1832, J. W. Colburn was born. He went to New York in 1850 and found employment with Arthur, Rumrill & Co., with whom he was very successful early in his career, within two years becoming the junior partner of the firm. Subsequently he sold out his interest and spent several years traveling abroad. In 1872 he accepted an engagement with Tiffany & Co., where his cordial personality and many other estimable qualities soon endeared him to his associates and made many warm friends from among his patrons. During the last two years his health had rapidly failed, until this Spring, when he made his last trip abroad in the vain hope to recover from the feeble condition due to tuberculosis. He returned two weeks ago and went to Saratoga, where he died on the morning of July 4 from hemorrhage. He was a member of the Suburban Riding and Driving Club, and enjoyed an intimate acquaintance with many of the best New York families. He was unmarried, and leaves a brother, Frank Colburn, and a sister. Mrs. L. E. Heath, of Milford, Mass. After an illness of two weeks, Charles H. Holder, the well-known silverware salesman of Tiffany & Co., New York, succumbed to cerebro-spinal meningitis and died at three o’clock Monday morning at his residence, 16 E. 56th St., New York. 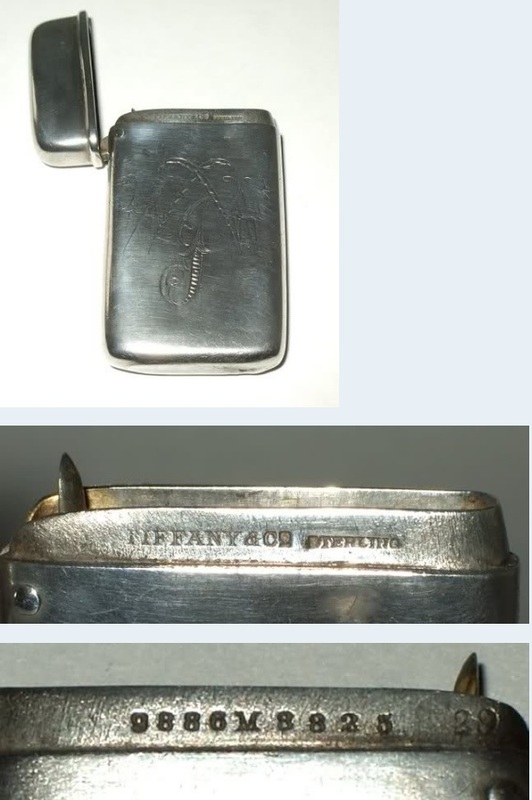 Mr. Holder was an Englishman by birth and had been connected with Tiffany & Co., about thirty years. He went into the employ of the firm when twenty-three years of age. He was of a very active temperament, and his untiring energy and politeness toward his customers brought him a large and valuble clientage, among whom he was esteemed as a warm friend. His inflexible devotion and fidelity to his employers secured for him an interest in the business, and at his death he held a comfortable amount of stock. Among his associates at Tiffany’s there was none more beloved or esteemed, for his warm and sympathetic nature constantly sought out the afflicted and unfortunates for whom his purse strings were ever open, while his voice was ever first to plead for leniency in behalf of the humblest employe who transgressed the rules of the house. The first number is the pattern number and dates to 1888. The capital "M" indicates that it was made during the directorship of Edward C. Moore (1873 ~ 1891). The second number is the order number, used "in house" by Tiffany to track production. The combination of the pattern number and the Moore "M" tell us that it was made between 1888 and 1891. During the stay of the Princess Eulalia, Prince Antoine and suite at Chicago, they visited, the pavilion of Tiffany & Co., and expressed surprise and pleasure at their remarkable display. The Princess announced in person the appointment of Tiffany & Co. as jewelers and silversmiths to her Highness. The firm’s exhibit has only been completed a few days, and these first honors coming so soon are a source of special gratification to Tiffany & Co., who have within recent years received over a score of other appointments from the royal courts, of Europe. Newark, N. J., Nov. 16.—Tiffany & Co., New York, have just purchased seven acres of land at Forest Hill, in this city. It lies between Second river and the Greenwood lake railway and west of Woodside park. The property was purchased of Heller & Weeks, and architects are at work upon plans for a large factory in which the firm will manufacture its silver and plated ware. The location is admirable, it being within a few hundred feet of the Forest Hill station on the Greenwood lake road, and within easy reach of the improved streets of that neighborhood. The business now operated by Thomas Shaw, who manufactures silverware for Tiffany & Co., will be removed from the Carter, Sloan & Co. building to the new works which when finished will accommodate from 200 to 300 workmen and will be conducted by Mr. Shaw. Harriet Olivia Avery Young Tiffany, the wife of Charles L. Tiffany, the famous jewelry merchant, died Tuesday, Nov. 16, at her home, 255 Madison Ave., New York. Mrs. Tiffany was 80 years old. She was born in Killingly, Conn., which was also the birthplace of Mr. Tiffany, and was the daughter of Judge Ebenezer Young and sister of J. B. Young, Mr. Tiffany’s first partner. Mr. and Mrs. Tiffany were married Nov. 30, 1841, and their life has been a long Summer of prosperity. The fortune of the head of the family is reckoned in the millions, and their domestic life has been placid and happy. Their children living are four—Louis Comfort Tiffany, the elder son, whose fame as a water color artist is considerable, and who is at the head of the Tiffany Glass and Decorating Co.; a second son, Burnett Young Tiffany, who holds an important position in the Tiffany store, and two daughters, Annie Olivia, the wife of Alfred Mitchell, and Louise Harriet Tiffany. Charles Lewis, Jr., the first born, died at the age of four, and Henry Charles, the third son, died when a year old. Mr. and Mrs. Tiffany have always lived in a style which may be considered extremely modest, in view of the great and constantly growing wealth which has been at their command. Some years ago Mr. Tiffany built a large and quaint mansion at 72d St. and Madison Ave., intending to make it his home; but when it was completed both he and Mrs. Tiffany decided that they could be more content in the old house in which they had lived for many years in Madison Ave., near 39th St. The new mansion was occupied by Louis C. Tiffany and his sister, Mrs. Mitchell. Mrs. Tiffany was four years younger than her husband, whose friends celebrated the 85th anniversary of his birth in February last. Their golden wedding was celebrated in 1891. Mrs. Tiffany retained the sprightliness and vivacity of youth until long past middle life, and even in her later years her activity was remarkable. She had a charming, motherly face, and a disposition of great sweetness. Neither she nor Mr. Tiffany indulged greatly in the more modern society functions, but both nave been extremely fond of old fashioned, simple sociability. The funeral took place from her late residence on Friday. The services were conducted by the Rev. Mr. Rudd, the assistant pastor of the Madison Square Presbyterian Church. They were extremely simple, consisting of two prayers, reading of the Scriptures and but one hymn, “Nearer, My God, to Thee,” which was sung by the Madison Square Church quartet. The casket was covered with a mantle of white carnations, with a bank of roses at the foot. The interment followed at Greenwood. At the Columbia commencement recently held in this city the university conferred upon Geo. F. Kunz, of Tiffany & Co., an honorary degree of Master of Arts. The degree, which was presented by Prof. Jas. F. Kemp, was conferred upon Mr. Kunz for his work on precious stones, mineralogy and meteorites. Leon Barre, of Tiffany & Co., New York, and Samuel Moore, Providence, R. I., were among the passengers returning from Europe on La Champagne, last week. George F. Kunz, the well-known gem expert with Tiffany & Co., delivered a lecture on American precious stones before the Franklin Institute, on February 17. Mr. Kunz treated the subject in his usual thorough and entertaining style. Mr. George F. Kunz, the gem expert with Tiffany & Co., has been appointed special agent in charge of the department of precious stones of the Eleventh United States Census. Mr. Kunz will collect all the statistics in reference to the production of precious stones in the United States as well as those in relation to the cutting of diamonds and other foreign stones. We extract the following from a New York letter: — " Tiffany, the great New York jeweller and silversmith, is building a palatial residence in Fifth Avenue, opposite the Park. I think it will be one of the show houses of the city when finished."